A time traveller visiting mid twentieth-century Britain would discover a painted world. Restaurants, department stores, schools and hospitals were filled with murals painted by the best artists of the day. Aside from a few celebrated examples (think Rex Whistler at Tate Britain), most of these have disappeared, and in many cases not even a photograph survives. This is true of the numerous murals painted by Barbara Jones, but occasionally we find a treasure that has escaped the general destruction, whether a mural itself or a study, as this seems to be. 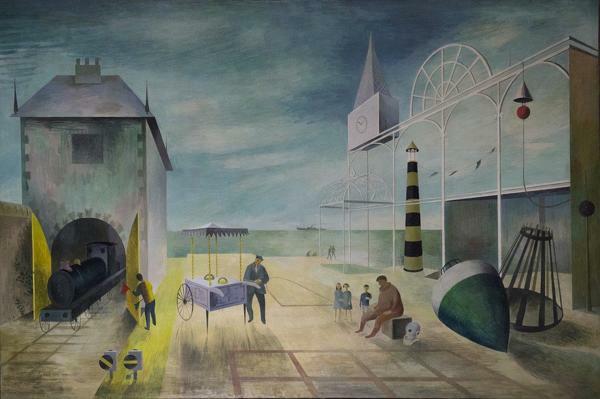 The Resort, which was shown at the First Exhibition of the Society of Mural Painters (the Victoria and Albert Museum, 1950), may have been related to Jones’ preparations for the Festival of Britain in 1951, but almost seventy years later it stands by itself as a work of great individuality and charm. Jones was taught by Eric Ravilious, and there are hints here of her teacher’s preoccupations with nautical design, improbably delicate structures and idiosyncratic wheeled vehicles. Her imaginative world has its own style, however, and its own distinctive palette. As so often with Jones, we see perspective and scale treated with a childlike playfulness, but it is clear that a sophisticated visual intelligence is at work. There’s a constant back and forth of dark against light, light against dark, and a beguiling clarity of vision. We sense that the scene, though in no way realistic, is real, and we share the curiosity and awe of the children admiring the deep sea diver as the ice cream seller looks on. Commentary by James Russell, independent art historian and curator, most notably of exhibitions at Dulwich Picture Gallery devoted to Eric Ravilious (2015) and Edward Bawden (2018).